Risotto with truffle oil makes a hearty, delicious main or side dish. There are many ways you can dress up plain risotto using flavors that pair well with the delicate, earthy flavor of truffle oil. Once you've tried it, this hearty rice dish just may become a mainstay of your cooking repertoire. Truffle oil typically contains an olive oil base that has been infused with the flavor of either black or white truffles. Truffle flavoring is very delicate and difficult to capture in an oil base, so many truffle oils contain flavoring chemicals that recreate truffles' characteristic flavors. Some of the more expensive truffle oils do contain bits of truffle or infused truffles. Which type of oil you choose depends on your budget and personal taste preferences. White truffles, which are more expensive, tend to have a more delicate flavor while black truffles are stronger with an earthy, tangier flavor. In general, truffle oil is a far less expensive way to get the flavor of truffles than purchasing the truffles themselves. All risotto starts by heating up butter or olive oil in a medium pan. Clarified butter works quite well for this because it still retains a buttery flavor, but the milk solids have been removed so the butter has a higher smoke point. If you use olive oil, there is no need to use extra-virgin or flavorful olive oil because all of the flavor will be cooked out with the high heat. Instead, use a lite olive oil or virgin olive oil, which have a slightly higher smoke point than extra virgin olive oil. Heat the oil over medium heat until it is melted. Risotto traditionally uses diced onion as an aromatic for flavor. You can try any type of onions such as sweet onions, red onions, spanish onions, yellow onions or shallots. Stir the onions in the heated oil for three to five minutes until softened. 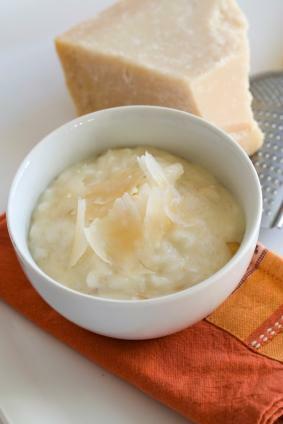 Risotto requires a medium-grain, starchy, non-sticky rice such as Aborio rice. The type of rice you use in risotto matters. The starch in the rice is what gives risotto its characteristic creaminess, while the low-amylose content reduces stickiness, keeping each grain of rice separated from the other. Add your rice to the oil and onions and stir constantly for two minutes to coat the grains of rice with fat. Traditional risotto uses vegetable, chicken, or beef stock for its liquid base; some recipes also incorporate a little bit of red or white wine for a hit of acidity and flavor. Warm the stock on the stove before adding to the risotto. When it is time to add the stock, add it one cup at a time. Stir the rice constantly as you add the stock, allowing the rice to completely absorb it before adding more. Once the rice has reached an al dente stage and absorbed all of the stock, stir in cheese. Traditionally, risotto contains either mascarpone cheese or parmesan cheese, however, other Italian cheeses like Asiago and Romano also work well. To add the cheese, turn off the flame under the risotto and stir in the cheese until it is melted. You have now made a basic risotto. Because of the delicacy of truffle flavor, it is best added at the end of cooking rather than incorporated in the cooking process. To make a basic risotto with truffle oil, simply drizzle a little bit of your chosen truffle oil over the risotto when you are ready to serve it. Mushroom risotto with truffle oil is a perfect combination of earthy and elegant. Rustic risotto, hearty mushrooms and refined truffle oil blend together in a dish you'll want to make again and again. Before incorporating mushrooms into your risotto, carefully clean them with a mushroom brush or paper towel. Don't soak or rinse the mushrooms, because they act like sponges and you will wind up with soggy mushrooms. Once you have cleaned them, slice off the fibrous end of the stem and slice or quarter them. Use fresh mushrooms for best flavor. Use a mix of more than one type of mushrooms to make the risotto more interesting. Try using dried mushrooms reconstituted in the stock you use in the risotto. Once you've selected your ingredients, it is time to put it all together. Start with a basic risotto. Use the stock in which you reconstituted dried mushrooms and about a quarter cup of white wine in place of part of the stock. Heat a sauté pan with a little bit of butter as the risotto cooks. Once the butter begins to bubble, add the mushrooms in a single layer on the bottom of the pan. If you like, you can add a tablespoon of chopped fresh thyme to the mushrooms for additional flavor. Let the mushrooms sit in contact with the pan for about three to four minutes without stirring. Once the mushrooms brown on the bottom edge, stir them and allow them to sit in contact with the pan again for another two or three minutes. Continue to cook, stirring until mushrooms are well browned and any moisture released from the mushrooms has evaporated. When the risotto has finished cooking, stir in the mushrooms as you add the cheese and cream. Dish the risotto onto plates or bowls. Drizzle a small amount of truffle oil over the top of each serving. A little goes a long way! Truffle oil and mushrooms are both very earthy flavors, while risotto is a warm and hearty dish. As a result, this dish works well with earthy reds. Pinot noir is nearly the perfect wine pairing to go with mushrooms, truffles and risotto. Try an earthy Pinot Noir from Oregon or a subtle Pinot from France's Burgundy region. Enjoy!